Spring has returned the robins the fields and forests around Bragg Creek. I found this one stirring up the leaves below these trees. She darted between the trunks and then flew up into the branches. The diffused background from a narrow depth of field reminded me of a watercolor painting. The monochromatic palette in the bark and dull yellow grass both warmed a little with the morning sun. Her orange belly was a welcome splash of bright color. This entry was posted on April 14, 2019 by Christopher Martin. 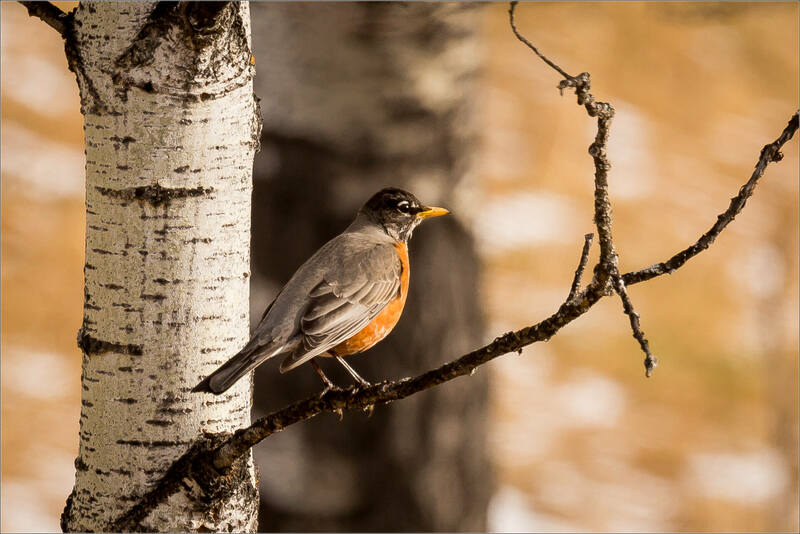 It was filed under Birds, Nature, Spring, Wildlife and was tagged with American Robin, animals, birds, bragg creek, signs of spring, spring, Turdus migratorius, wildlife. It’s so confusing to me that the American robin is such a totally different bird than the European robin. Live them both though! I so rarely get to see a robin, and this year they seem not to have included us in their migration path. That makes your photo all the more delightful; they’re a favorite bird, and it’s always good to see them. Quite painterly and very beautiful, Christopher. A welcome sign of spring. Lovely image and I do like that watery effect.